If you are having trouble getting air to some zones within your building, it could be due to duct leakage. If your ducts are leaking 20% of the air that is passing through them, it is not surprising that some of the zones (particularly at the end of the system, and particularly on the most extreme days of the year) are not getting enough air. Before adding “band-aid” solutions to those zones, consider having your duct system tested for leakage, and if they are leaking, sealed with Aeroseal. 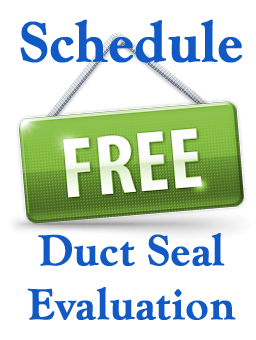 If a Test and Balance report shows that you are not getting adequate flows to some grilles, or that the grille flows do not add up to the flow at the fan, you should consider getting your duct system sealed with Aeroseal. Aeroseal is able to seal leaks in otherwise inaccessible duct systems is both new and existing buildings. If you want to reduce your utility bills without a large capital expenditure, you should consider having your ducts tested for leakage. Duct leakage can more than double fan energy use, and, depending upon your building, also increase heating and cooling energy use significantly. 25% leakage in a supply duct system increases the amount of air that needs to be moved by 33%, which increases fan energy use by 98%. Should your building use 100% outdoor air (e.g. laboratories, hospitals, casinos, some manufacturing facilities), your energy savings potential is magnified by the fact that any excess flow due to leakage also translates into the need to heat or cool that excess air flow. If your cooling or heating needs have increased, perhaps due to higher occupancy, you may be able to meet the increased needs simply by sealing the leaks in your duct system. If your ducts are leaking 20% of the air that they are supposed to be delivering to the zones, simply sealing those leaks can increase your ability to cool zones with increased cooling loads. Aeroseal generally seals 80-90% of the leakage encountered. Most hotel, apartment, condominium and dormitory toilet exhausts do not work as designed, due to changes in the direction of the building’s “chimney effect” between the winter and the summer, and due to duct/shaft leakage. The “chimney effect” is caused by the temperature difference between indoors and outdoors, which means that lower floors are pressurized in the summer and depressurized in the winter, making it essentially impossible to balance the system once and then leave it. Duct leakage also compromises the performance of self-balancing dampers that can be used to address the changing chimney effect, but which need a consistent minimum duct pressure to operate properly. Moreover, excess exhaust flows translate to large increases in fan energy and heating/cooling energy use. Decreasing exhaust flow by 20% decreases fan energy use by almost 50%, while decreasing the heating and cooling needs for ventilation by at least 10%. If you have trouble removing moisture from humid environments (such as shower rooms), do not assume that you need to add an unsightly exhaust fan to the wall of that room, or that you need to install a larger exhaust fan on the roof. Exhaust systems have been found to leak more on average as compared to supply systems, often more than 25% of the fan flow. Thus, you should consider testing for duct leakage and sealing it before entertaining more expensive/invasive measures.